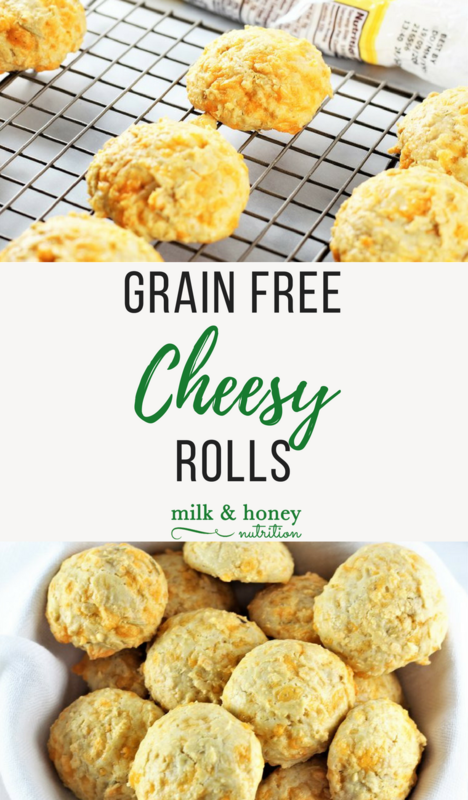 These grain free cheesy rolls are a staple in our house. I used to buy a mix to make these, but then decided to figure out how to make them from scratch, and let me tell you... it's super easy and about 1/3 the cost! This recipe was sponsored by Bob's Red Mill. All ideas and thoughts contained on this page are my own. Mix the first 7 ingredients together gently. (Tapioca flour tends to be kind of messy!) Slowly beat in the oil, eggs, and cheese. Gradually add the water while beating on low speed. Refrigerate dough for at least 10 minutes, preferably 30 minutes. Bake at 375 degrees for 20-25 min depending on your oven. They're ready when you can see the cheese browning and have hardened just slightly on top. This recipe can make about 20 bite size rolls, 10 dinner size rolls, 4 sandwich buns, or 4 hot dog shaped buns. We like to stuff ours with all natural chicken sausage, spinach, and onions. And they freeze great too! *They can be made dairy free if you omit the cheese.